Thanks to the as usual spot-on Ian Bone for this reminder that in modern Britain people still get beaten up, and sometimes killed, for wearing different clothes or liking different music. 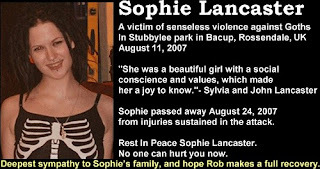 Sophie Lancaster, aged 20, was murdered in Lancaster for the crime of being a 'goth'. Her boyfriend is seriously injured. what is wrong with these people who do these things?! this is horrible. its so socialy unacceptable to be difforent now that people think its ok to kill people, just for the way they dress. and did anyone notice that this has hardly even been covered in the news? maybe because the media doesnt think its important. it would seem no one finds this kind of freedom of expression important, in what is supposed to be a free country. I am a 37 year old male. I have two children who are growing up in an ever increasingly violent society which worries me greatly. Something needs to be done to stop these vile animals from threatening our childrens right to their individuality. How are Sophie's parents supposed to deal with the fact that their beautiful daughter has been murdered for absolutely no reason by low life scum that don't serve any living purpose. Bring back the death penalty and rid the world of this disease. My thoughts and heart felt sympathy go out to sophie's parents and to anyone else affected by this kind of mindless violence. This is terrible. It does seem that battle lines are being drawn and it's not quite fair just to toss the blame from one group to the next. We are a very mobile, mid- to upper-middle class family with two successful children. What worries me is that my son, despite attending medical school likes to dress as a chav, it is is his image. We are, of course, upset by this, but have always raised our children to be indendently-minded. He is the least anti-social person that you would ever meet but, ugh, all the shell-suits, kangos, gold jewelry, Burberry and Carhartt. I really fear for him leaving the house like this. We live in Sussex. Do you think he is in danger from Goths or other groups now?